Washi no Yado Nazuna is located right beside Nijo Castle. 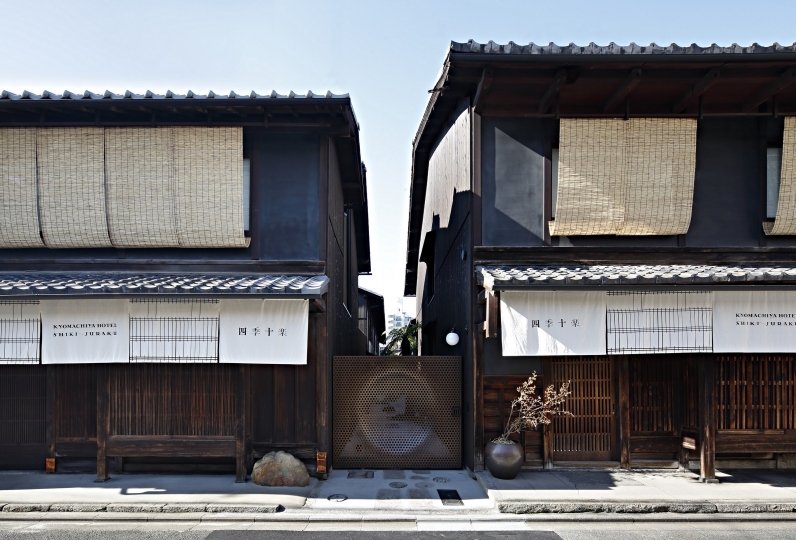 Renovated from a traditional Kyoto wooden townhouse built over 90 years ago, the interior is designed with the theme of washi paper in mind. The spacious interior and soft lighting greets you from the entrance. 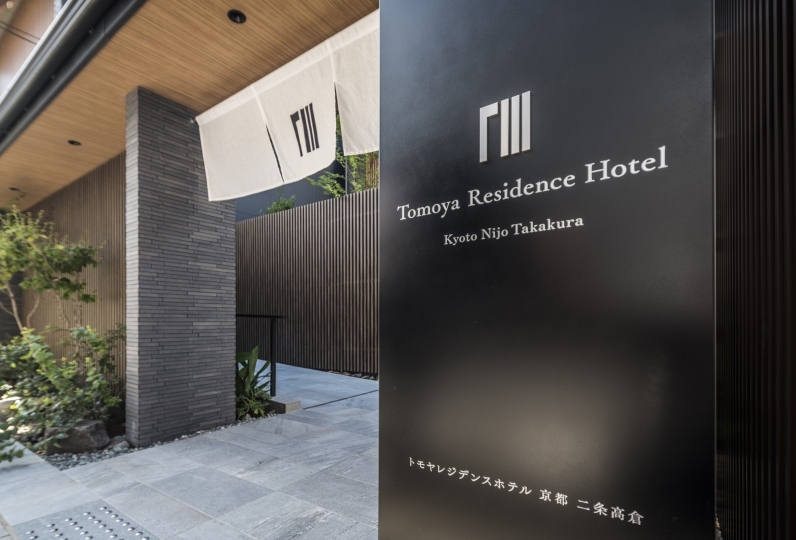 Washi paper is used extensively in both decorative pieces and interior furnishings of the rooms, enveloping you with a sense of warmth that will bring you peace of mind. 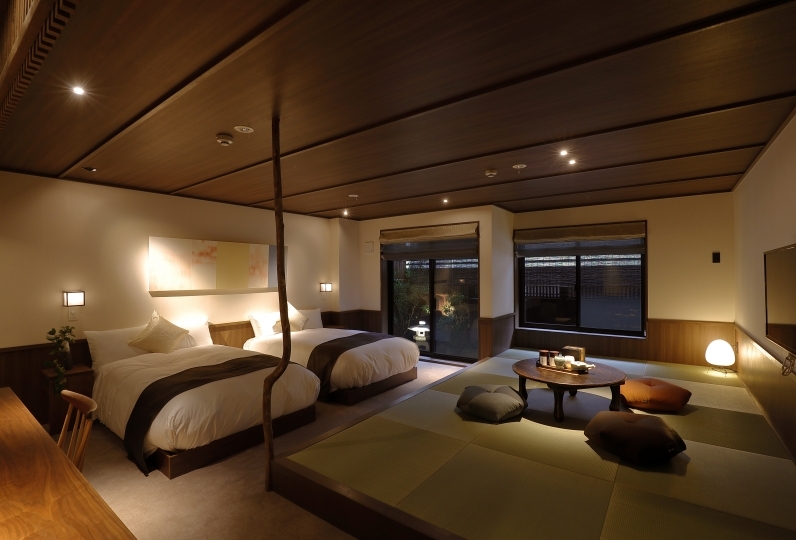 Behind the rooms lies a charming Japanese garden. The soft lighting from the washi lamp creates a romantic atmosphere. Soaking in the bath while enjoying the view of the garden is sure to relax both your mind and body. Guests can also enjoy seasonal delicacies here at Nazuna. Seasoned to bring out the natural taste of the ingredients, the food served here is abundant in variety and color. The taste and smell of the food enhanced by the charcoal of the irori hearth is sure to charm you. 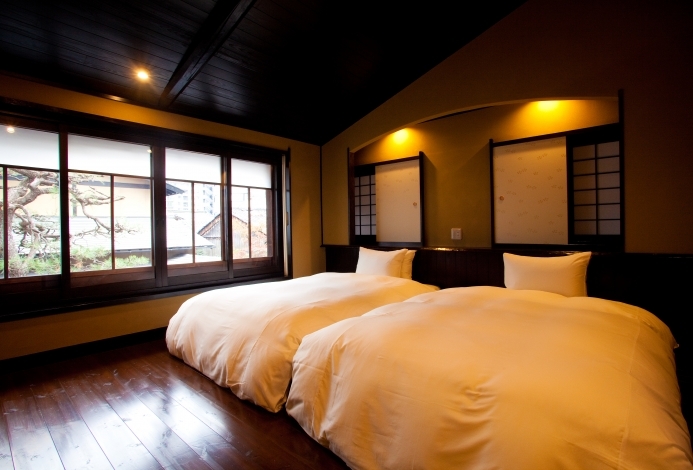 In addition we have activities representative of Kyoto available here as well. 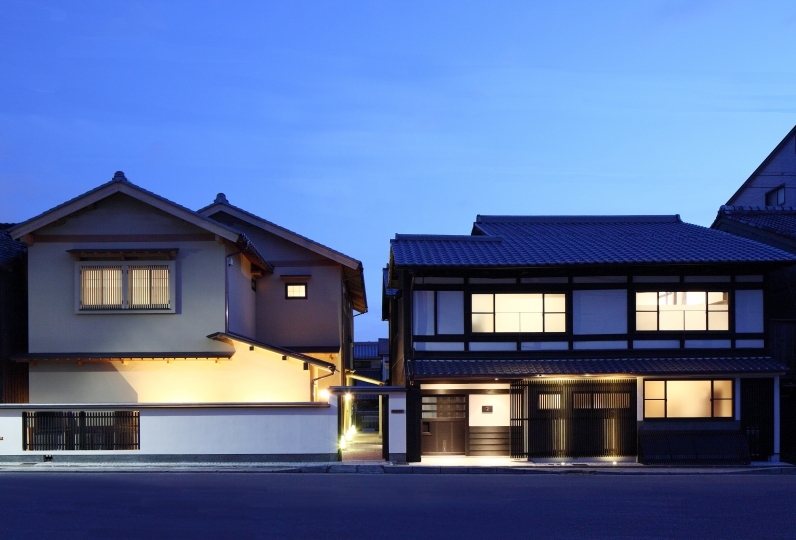 At Nazuna we provide guests with the opportunity to experience Kyoto culture with activities such as making matcha tea, temple visits, and walking around in kimono. 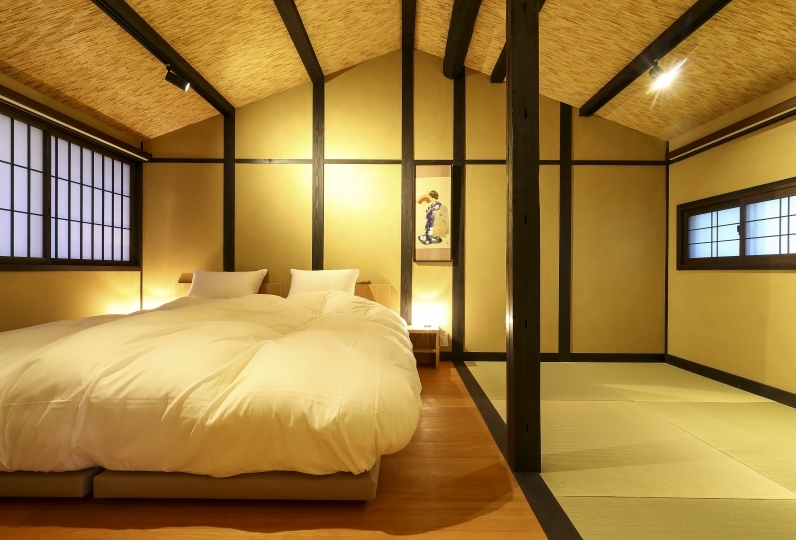 This machiya townhouse stay provides an experience inspired by the traditional Japanese craft of washi paper, which is also an Intangible Cultural Heritage registered with UNESCO. Enjoy a wonderful time here in your own private space with the entire place to yourself. It was a fun and wonderful experience. I was thrilled to have had authentic green tea in my room. It was ginger rain, but it is fun to walk in the rain with a very nice umbrella with a built-in Japanese umbrella. The open-air bath while looking at the garden was so calm that it had a taste. I could sleep comfortably with the futon that was 4 sets. In the morning when it came to light, the weather was getting better and I was able to enjoy Kyoto and come back. Also, we are looking forward to it. Please give my best regards to the young female staff who responded in the room. *Children below 5 years old are not permitted to stay here. *Kindly let us know your estimated time of arrival beforehand. Please be sure to let us know beforehand if you are scheduled to arrive after our check-in counter closing time (9:00pm). *Upon arrival, please contact the staff using the telephone at the entrance. We will let you know the passcode to the door entrance. *Smoking is prohibited in the entire ryokan.